In order for any Chamber of Commerce to be successful, total involvement and commitment must be met. A Chamber of Commerce is only as strong as its membership. The objective of our Chamber of Commerce is to PROMOTE MARLIN. As a small group, we are limited in what can be accomplished. As our membership grows, we gain strength. With this new strength, we can attract new industry and business to the area. When Marlin grows, the current businesses benefit, as well as its citizens. With new members we not only benefit financially but we gain additional “voice” and input as to Marlin’s needs. The Marlin Chamber of Commerce has been very successful in the past. 1. As a result of combined efforts with Marlin Development Company, the City of Marlin, and Falls County, the Chamber played a major part in acquiring the Hobby Unit of the TDC, which currently provides over 350 jobs in the area. 2. 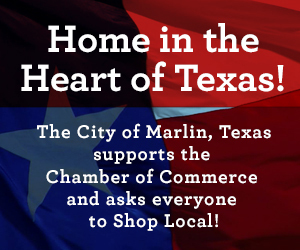 The Chamber of Commerce worked with the City of Marlin to qualify and to be accepted as a Texas Main Street City. This program enables Marlin to restore and improve the downtown retail district through assistance of the Main Street Program. This not only will increase business and employment for Marlin, but also will add to the appearance of that area and attract more visitors. 3. The Chamber sponsors the Annual Christmas Parade. This draws attention to our downtown area and its merchants. 4. New businesses are welcomed with a Ribbon-Cutting. 5. The Chamber provides newcomer packets to all new teachers coming into the district each year. 6. As a group, the Chamber is involved with the transportation needs and improvements for the area. It has been involved in the improvements of the highways and roadways for access to Marlin and is currently following the plans of the Highway 6 expansion. 7. 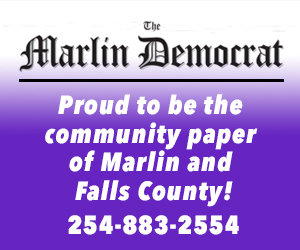 The Chamber provides City of Marlin and Falls County 911 Maps. The maps enable visitors to locate business locations and residential addresses. 8. The Chamber of Commerce office is often the first stop for visitors and prospective businesses in Marlin. Daily, numerous telephone inquires give our secretary, Cynthia, the opportunity to promote Marlin and its businesses. The Chamber provides information pertaining to the schools, utilities, city government, banks, and medical facilities. It has lists of churches, clubs and organizations, and major employers in Marlin. 9. The Chamber has numerous items of memorabilia available for purchase: Marlin Afghans, coffee mugs, T-Shirts, caps, and Christmas Ornaments. 10. A Copy Machine and Fax Machine are available for use-free to Chamber Members (50 copies or less)-and for a small fee to non-members.